You get a more stations nowadays, but they’re nowhere near as profitable. Back when I was searching for gainful employment I made a hard push for an opening at KGTV in San Diego. I didn’t get the job. In retrospect that’s fine. Actually, it’s now finer. McGraw-Hill just announced KMGH has been sold. I wish the folks at KMGH the best. The period between this type of announcement and a transaction’s closing is often unpleasant. The seller has every incentive to take a short term attitude and spend as little as possible. The product (and morale) suffer. McGraw-Hill is known as a good company. Maybe they’ll be different? It was interesting to see what $212 million buys in 2011. Here’s how that compares to 1985. That’s when WTNH was sold by CapCities. 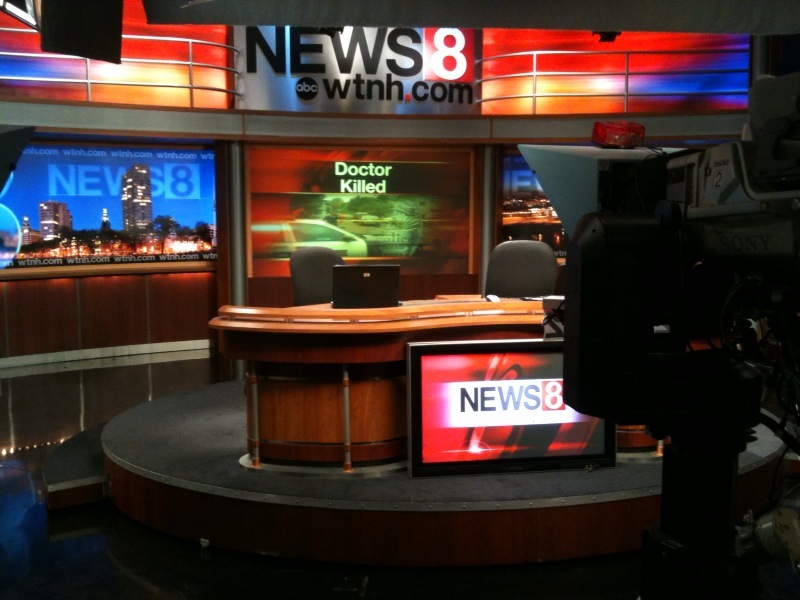 An entity controlled by the partners of Whitcom Investment and Anchorage-based Cook Inlet Region Inc. has won the bidding for WTNH-TV, an ABC affiliate in the Hartford-New Haven area, for which it will pay about $170 million, according to the sources. That’s one station, the building on State and Elm plus the transmitter facility in Hamden for $170 million. The Hartford/New Haven market is comparably sized to both Indianapolis and San Diego. WTNH-TV’s 1984 operating income was $14.6 million on net revenue of $24.9 million, resulting in a 58 percent profit margin. Over the last five years, the margin has reached 62 percent and has never fallen below 58 percent. The station’s margins are unusually good. Their partnership would later find its way to court, but back then they were amazing. It’s entirely fitting that on this my 27th anniversary of being on-the-air in Connecticut I am not on-the-air. It’s been an upheaval year for me here in the land of steady habits. 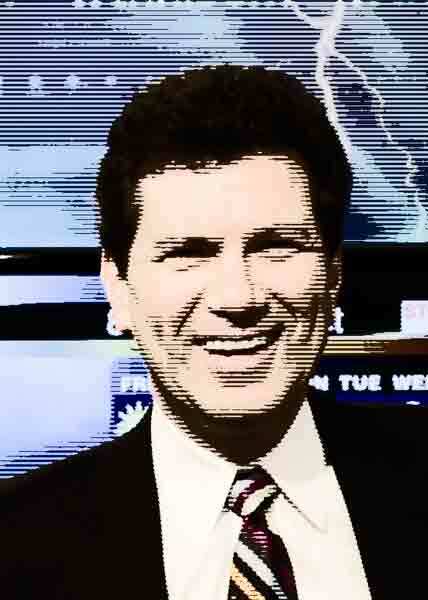 May 21, 1984 when I began at WTNH Action News I worked with Al Terzi and Geri Harris. Bob Picozzi was our sports guy. I replaced the beautiful and gracious Beverly Johnson. Our two other weather people were Linda Church (at WPIX for a long time) and Bruce MacFarlane. One day Bruce sort of disappeared and I’ve never heard from or of him again! Strange. May I talk about Al? I loved working with Al. It can be argued he is the best known television personality in Connecticut. He always listened to what I said and laughed when he thought I was trying to be funny–even when I failed. On TV that is the finest example of team player. I will always be grateful. I remember that first September choppering up to the Big “E” with Al. We flew in this little bubble Engstrom cramped in with Al Notzel the pilot. As we walked into the grounds it was as if Al was a Deity. I have never seen more heads turn. Geri on the other hand didn’t seem to get me. It felt like she disapproved of me every night on TV. Later Al and Geri were moved off and John Lindsay and Janet Peckinpaugh were brought in. Lindsay never seemed to make the geographic commitment and soon returned to Colorado. Al Terzi who had been demoted was paired with Janet Peckinpaugh. Their partnership would later find its way to court, but back then they were amazing. Whatever “it” was Janet had plenty! She was the most glamorous anchor I’ve worked with. She was a real celeb. Viewers loved her. They couldn’t get enough. My bosses were Mike Sechrist and Wendi Feinberg. I am still very close with both. I have thanked them dozens of times for this opportunity. Helaine says I still have a lot of TV left in me. It’s good I’m not done yet. If you don’t know Tim I ask you to judge his impact by the people who showed. I know I’m going to forget names so feel free to remind me. Tim Wright’s been a shooter at Channel 8 for 31 years. He retired tonight. There are few in government, sports and politics who hadn’t run across Tim. Everyone in the media knows him. He is among the most relaxed people I know. No one laughs more, or more distinctly. Bob Picozzi, Skip Church, Diane Smith. Kenn Venit. Former General Manager Lew Friefeld. Former everything else manager Stan Roman. Roseann. Nancy. Lisa. Nyberg, Kountz, Kramer, Baghdady, Finz. Erin Cox is a new mother. She looked fabulous. She was radiant. Tracey came after she dropped Tallulah off with Helaine. We are sitting. Jose was upset with me. Kent Pierce, Chris Velardi, Annie Roarke, Jocelyn (like Cher one name is sufficient), Kristen (ditto). Johnny Mongillo, the world’s most interesting man. Dobratz and Pierson (unshaven and very Hollywood). The food and open bar were on NABET the union that serves Channel 8’s photographers, engineers, floor crew, producers and directors. Thanks. Tm’s been through film, then carrying a camera and large tape deck. We later shifted to camcorders — still bulky and now smaller and less expensive (though technically superior) cameras. He has toted gear in every kind of bad weather imaginable. While reporters are in the truck writing stories guys like Timmy Wright are often outside setting up the live shot. Tim will retire to South Carolina where the snow seldom falls and where he’ll never be asked to stay overtime or work a sixth day. Someone commented it was “good to see Tim leave standing.” Yes it was. Click for Ann Nyberg’s photos from Facebook. The control room is just the most obvious addition in a project which will replace nearly every wire and piece of gear at the station. It’s a crazily complex project. 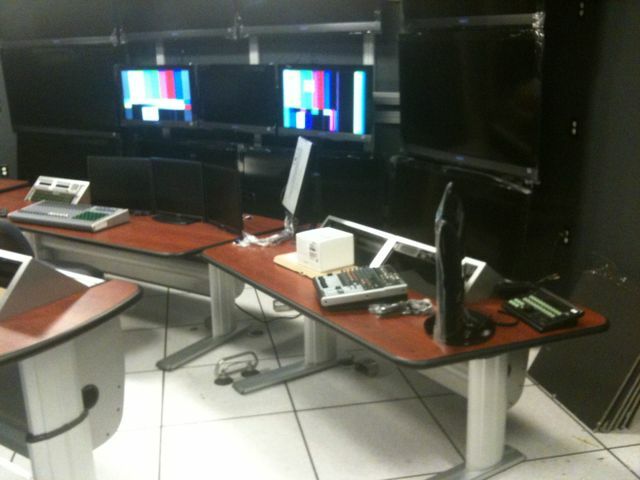 A new control room is being constructed at work. That’s actually an understatement because the control room is just the most obvious addition in a project which will replace nearly every wire and piece of gear at the station. It’s a crazily complex project. 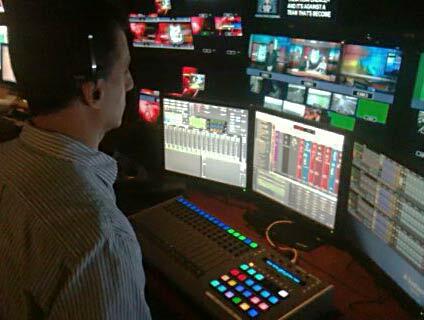 Instead of the traditional broadcast switcher we’ll be using Ignite from Grass Valley. Think non-linear editor or PowerPoint for a live broadcast. It’s more structured than a legacy control room but it’s a whole lot less labor intensive which seems to be the goal everywhere nowadays. Here’s a very short video to show you a little of where we are. 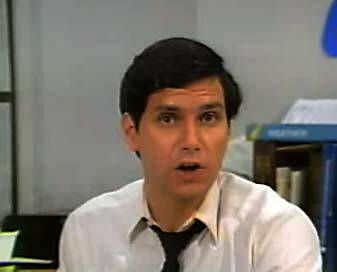 If you’re a longtime Connecticut resident you’ll remember Al Terzi anchoring with Janet Peckinpaugh, Diane Smith’s voice is there along with a waterlogged David Henry and some folks I just don’t recognize anymore. 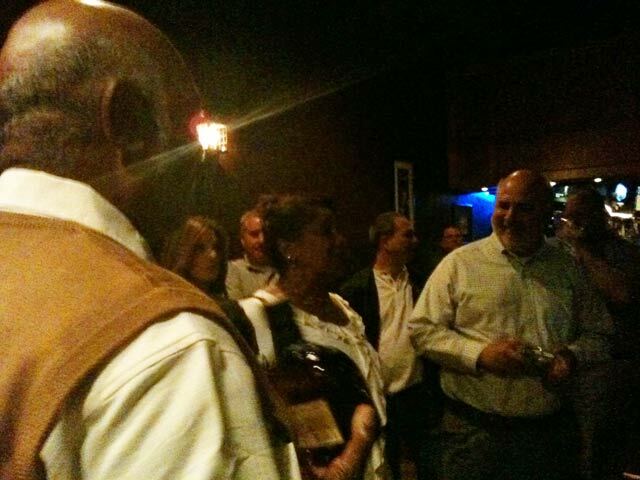 My friend Ryan Hanrahan posted this video to his blog earlier tonight. I didn’t even know it was around. It’s from a special we did on WTNH after Hurricane Gloria. If you’re a longtime Connecticut resident you’ll remember Al Terzi anchoring with Janet Peckinpaugh. Diane Smith’s voice is also there with a waterlogged David Henry and some folks I just don’t recognize anymore. And, of course, the Action News music! It was 25 years ago. I look so young! Author Geoff FoxPosted on May 21, 2010 May 21, 2010 Categories UncategorizedTags Al Terzi, Beverly Johnson, Bob Picozzi, Bruce McFarland, Diane Smith, John Lindsay, Linda Church, WTNH8 Comments on Ask Me Anything–26 Years Ago Today! Viewers loved Janet because she seemed vulnerable. Politics commands a thick skin. Can vulnerable and thick skin coexist? We’ll see. The emails have trickled in over the last few days. Janet Peckinpaugh is thinking about running for the 2nd District congressional seat held by Joe Courtney. She’d be running for the Republican nomination against Daria Novak (who has appeared on this blog… and was a good sport about it). I’d better throw in some back story, because as big as Janet was you might not know who she is! Back in the 1980s the Connecticut television news race was divided this way: Channel 3, everyone else. In this case everyone else was mainly Channel 8. Channel 30 with much less reach as a difficult to tune in UHF station was specklike. Channel 61 wasn’t yet on-the-air. The company that owned Channel 8 made a decision to get competitive. That was gutsy because WTNH was more profitable than WFSB! It had a smaller audience but also spent a lot less. The owner, Capital Cities Communications, moved their hotshot news director, Mike Sechrist, to New Haven from Fresno. Then they opened their wallet. 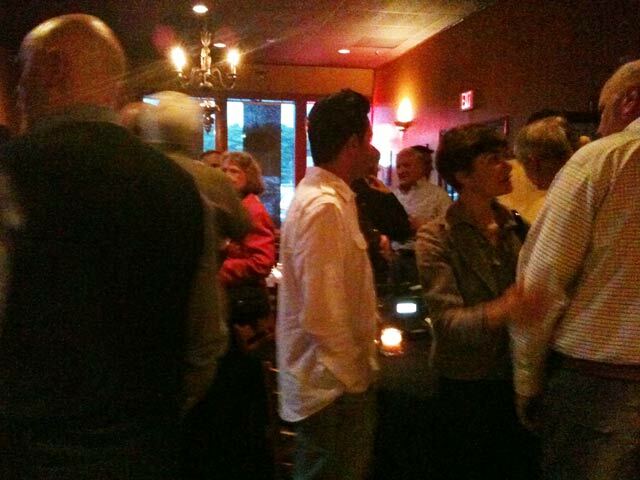 Not every move Mike made worked, but one was so successful it trumped everything else (next to hiring me, of course). 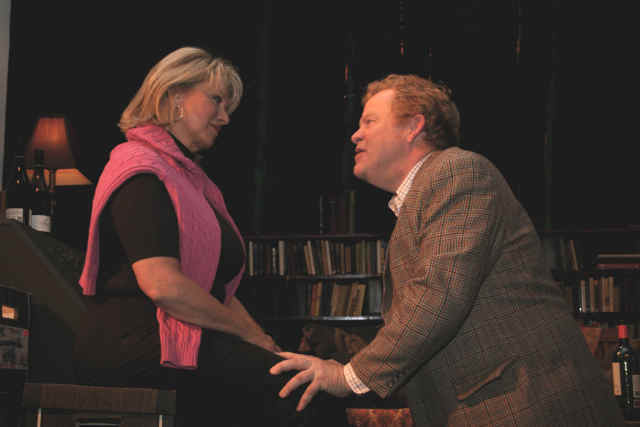 He hired a young, sweet looking, Janet Peckinpaugh. I seem to remember her coming from Richmond, VA–but don’t hold me to that. I can’t explain Janet’s success except to say she had that magical “it” that make some people on TV stand out. Actually, Janet didn’t have “it” as much as she had “IT!! !.” She was vulnerable and approachable. She was very pretty but not where women didn’t wanted their husband’s watching her. With Janet (and a rejuvenated Al Terzi) our audience grew until we caught Channel 3 at 6:00 PM–an amazing achievement. Helaine and I were friendly with Janet. She was always very nice to me on-the-air and off. We went to her spectacular wedding atop Hartford Steam Boiler Company. It was probably the most glamorous affair I’ve ever attended. Then, for reasons still not clear to me, Janet left and the station wallowed. Think balloon and pin! As is often the case in TV her earlier success did not follow her up I-91. She was later involved in an ugly lawsuit and finally anchored at Channel 30. When last I saw her on-air she was the anchor on infomercials for a mortgage company. Am I surprised she’s considering congress? Yeah. Not that I think about Janet often, but even if I did I’d never make this leap. OK, I haven’t known her for over twenty years. Everyone changes. Maybe a smoldering political fire has finally come to life? Maybe there’s something in the DNA of people who do what we do? I have often thought about running for Congress. I have too much respect for my incumbent congresswoman to ever seriously consider that, but the thought’s there in the abstract&185. We all have dirty laundry. Helaine reminds me of mine all the time. Imagine if your life was poked and prodded at by an opponent who wanted you gone! I’m not sure Janet’s so special in that regard, but maybe. When Kevin Rennie blogged about this yesterday the mean comments weren’t far behind! Her unquestioned sweetness of the 80s is now questioned. &#185 – After writing this entry a co-worker called me out for this paragraph. She said I made it sound like I could beat Rosa but won’t. I can see how that might be the impression. Let me clarify. Rosa DeLauro is unbeatable in this district. Right now you would have to be a fool or extreme doctrinaire to run against her. There’s a reason few who want to serve in Congress do. There are people like Rosa already there. To me that’s OK because I like Rosa. God, I hope that’s more clear now. Author Geoff FoxPosted on May 1, 2010 May 10, 2010 Categories TelevisionTags Al Terzi, Janet Peckinpaugh, Mike Sechrist, WFSB, WTNH6 Comments on Janet For Congress? I’m back at work tonight. It’s been a long time since I worked a full week. Some folks were sending email wondering if I was still employed. That’s a reasonable question all things considered. First I had to take four days off for my mother’s surgery. The next week I was off the early newscasts while I created the maps and graphics we needed for our new look in weather (more on that in a sec). Last week my folks were visiting and I was off again. I have no away time planned for a while! They’re stuck with me now. I got to work early today, before 1:00 PM. It was the day of our switch to 16:9. I needed to make sure there was enough time to make the final changes. I’ve written about this before. 16:9 is the shape TV is headed and, if your set is of recent vintage, what you’re watching today. All the maps and banners were created before I left. 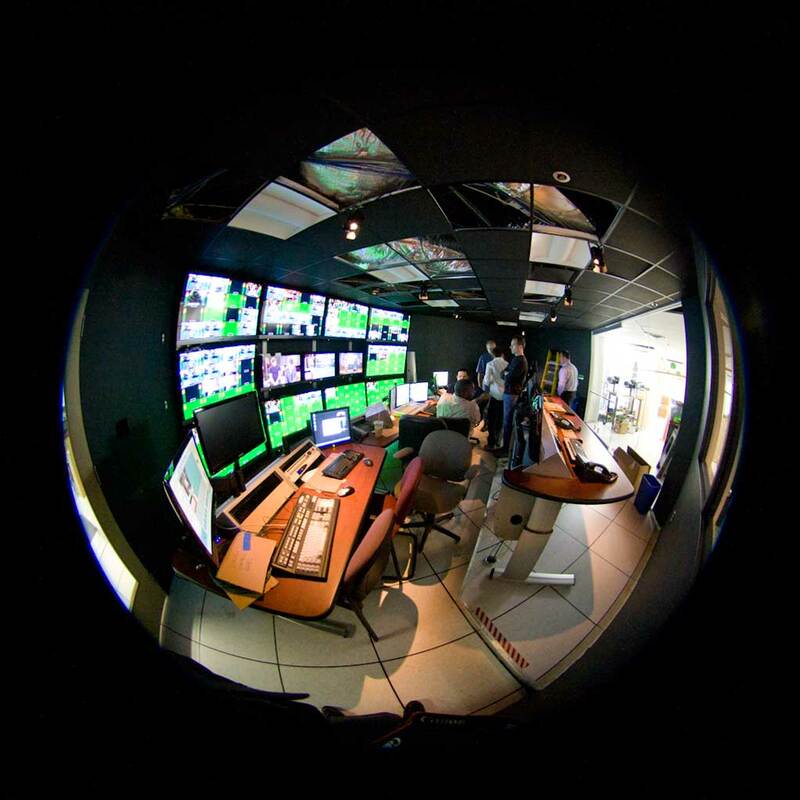 Now I had to enable the newly shaped video on our main and backup weather computers and our engineers had to route them into the control room. Little things I’d forgotten suddenly became obvious, There were some moments when we all threw our hands in the air, but before long it was all working… and it looked good. Tonight at 5:00 PM the station went live with the new shape and a new look. There’s a whole lot of red going on. The looks is more contemporary and bold. Note to readers: I don’t know why we changed. I’m sure there’s a good reason. OK–I hope there’s a good reason. Sometime soon someone will slip up and say the wrong thing. It’s like writing the wrong year on checks in January. It will happen and the tension will be broken. Right now no one wants it to come from their mouth! Please, let it not be me. We’re using cups I haven’t seen in years. Unearthing these cups is like going on an archeological dig. My folks are here. It’s great having them. We’re trying to show them as good a time as is possible. Would you expect different? Every morning Helaine makes decaf coffee for them (aka – warm brown water) and real coffee for me (aka – real coffee). Over the course of a day or two that’s a large number of cups going into a large number of cups. 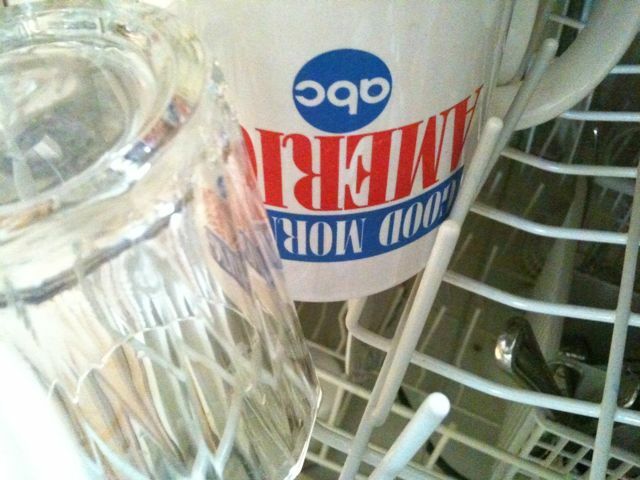 Between dishwashing cycles we’ve made it to the bottom of the coffee cup supply. We’re using cups I haven’t seen in years. Unearthing these cups is like going on an archeological dig. 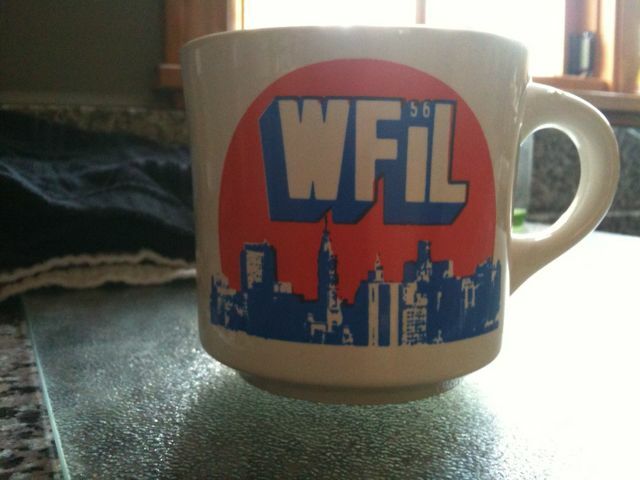 I’m not sure where the orange WFIL cup came from, but 560 WFIL was Philadelphia’s premiere top-40 station in the 60s, and 70s. By the 80s music on AM faded. I’m not sure what WFIL’s doing today. Whatever it is would be sad to hear. 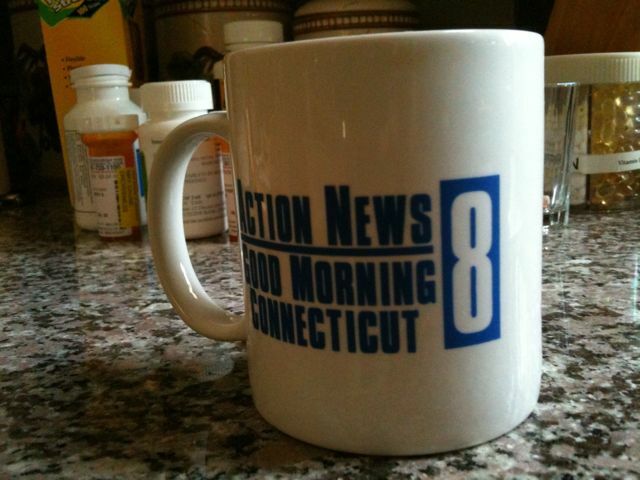 The WTNH cup has to be old just by virtue of the rectangular “8” logo. There was a time when TV stations didn’t realize viewers would watch local stations while getting ready for work or school! Our pre-Good Morning America newscasts were underfunded, understaffed and in many ways afterthoughts. When I got the Good Morning America cup it was filled to the brim with coffee. It came from Harold, one of the GMA stagehands. It is indicative of the level of staffing and importance that show held. That was part of why I enjoyed doing GMA so much. How many jobs still come with free coffee and someone to wrangle it? Don’t answer. Too depressing. Does seeing what he wrote upset me? Of course it does. I tried to respond there, but the website fired off an error message saying it couldn’t connect to its database. “[A] promising period of snow and cold temperatures are in the forecast. We’ve got to get Jim a spell checker. Actually, even if it was spelled right, what’s a condescending smug? He’s mostly right though. I’m not exactly anti-snow (can one actually be anti-snow? ), but I am a snow hater. Not Jim. His blog is named “Snow Zone.” Duh. He’s unhappy with me. I suspect he thinks my admitted bias affects my forecast. He probably prefers those who predicted 100 of the last 25 inches of snow! To them hope springs eternal. All potential Nor’easters become Nor’easters. That’s not real life. That’s not me. My forecast doesn’t make the snow come. As Dr. Mel says, “We’re in prediction, not production.” The snow is a passive observer. It does what it wants. My job is to be as accurate as possible. Bias be damned. There’s no upside to being wrong. I’ve been wrong enough times over 25 years to know I want to avoid it (and to avoid humanity in general after I’ve been wrong). Does seeing what he wrote upset me? Of course it does. No one wants to read along as the author tries to put you down (though, as hinted at earlier, it would be more effective if the Assistant Managing Editor of the Connecticut Post properly spelled his words and structured his sentences). Stuff like this comes with the territory. I do a better job dealing with it than I once did. Anyway, the posting is not as bad as it looks because he wrote enough specifics to realize he does watch! The blogger doth protest too much. &#185 – The Connecticut Post was the Bridgeport Post. Like many papers attached to a downtrodden urban center with wealthier suburbs (Newark Star-Ledger, Camden Courier-Post to name two) it changed its name. That might be good for the paper while simultaneously demoralizing for the formerly named city. It wasn’t until today I saw the story… and I was actually clever in print. 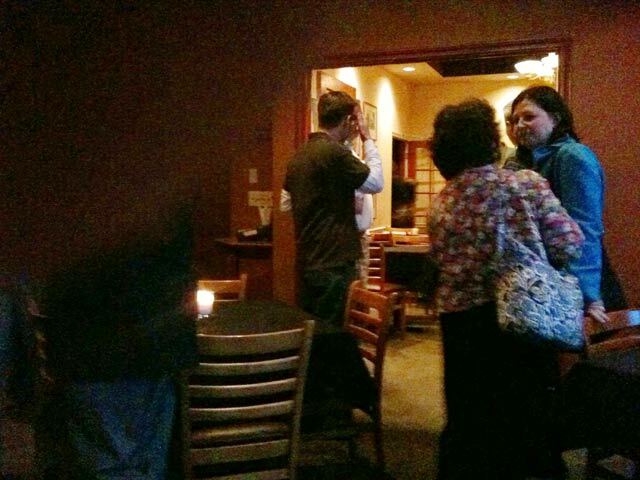 Last Friday I was called by Susan Misur at the New Haven Register. She was writing a story about Hurricane Bill and was looking for some meteorological help. No problem. I like ink! “I think this cold front will stand between us and the storm like a bouncer stands at the door to a club. 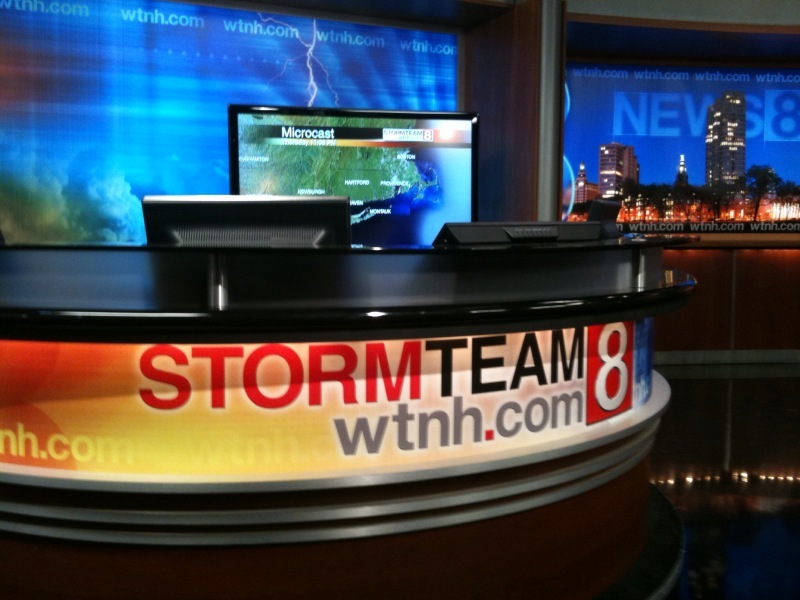 Hopefully, it will protect us,” said WTNH meteorologist Geoff Fox. Do you really have to be a meteorologist to say stuff like that? Author Geoff FoxPosted on August 25, 2009 Categories UncategorizedTags Geoff Fox, meteorologist, Susan Misur, the New Haven Register, WTNH, WTNH meteorologistLeave a comment on Really? Did I Say That? Sure, there will be more talented people. There might even be people who will stay longer–though that seems doubtful. But no one will ever be seen by audiences as large as we had in the 80s and 90s. I’d seen Mike hoping to fill his weather opening in New Haven. It wasn’t destined to be. 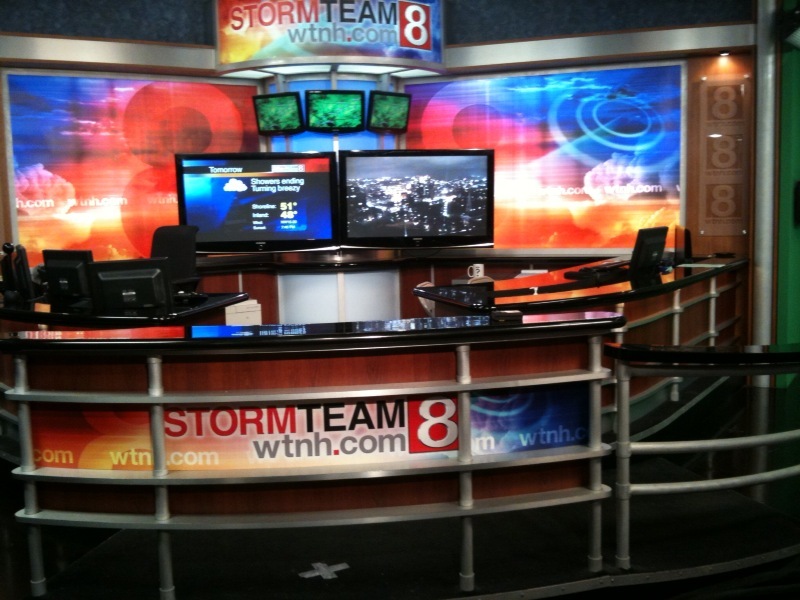 But, surprise, I did get it–the weather job at WTNH. I began May 21, 1984. Thursday was my 25th anniversary. I can’t remember what kind of day it was when I started, but I do know I sat with Al Terzi, Gerri Harris and Bob Picozzi in front of a blank blue wall. We had no real set. All the backgrounds and frames were inserted using chromakey. I did my first tease before my first weathercast saying a few words and ending with, “Well, how am I doing so far?” It was a line I’d first used on my first day in radio–probably stolen from someone much more clever. Gerri looked at me as if I’d just parachuted in from Mars. In my 25 years she was one of two anchors who obviously ‘didn’t get me.’ Al, on the other hand, laughed at every joke I told–funny or not. What Al did was like comedy kindling and it helped establish me. I have survived four general managers (with a fifth soon-to-be hired), ten news directors and scores of producers. I have outlived all the other on-air people at Channel 8 that day in 1984. Considering I’d bounced around radio for 11 years before getting to Connecticut that’s quite a feat. I don’t know how it came about… these 25 years. It’s nothing you aim for. I seem to remember thinking of WTNH as a good stepping stone, not a final resting place. And yet I stayed. For a while I filled in for ABC on Good Morning America. Maybe I thought the network would come calling–but they didn’t. So I stayed and stayed and stayed. I built a very good life first for Helaine and then Stefanie. My parents moved to the area and then moved away. We set down roots. I tried to give back, especially with charity work. You don’t go to work on day one hoping to stay 25 years. I certainly didn’t. It’s all one day at-a-time and then, all of a sudden, those days begin to add up. Prospective employers look at people who change jobs a lot as having baggage. Once you’ve stayed too long you’re looked at the same way. There will never be another Geoff Fox in Connecticut. Sure, there will be more talented people. There might even be people who will stay longer–though that seems doubtful. But no one will ever be seen by audiences as large as we had in the 80s and 90s. That tonnage is gone. It’s affect is cumulative over the years. I have a great job. I enjoy coming to work nearly every day. Even after 25 years no one will ever accuse me of phoning it in. I am a well defined personality and though lots of people like me, there’s also a sizable contingent who don’t. No gold watch today, I got a plaque. I’m taking off Friday but I’ll be back Monday.